Well that was a day to remember! 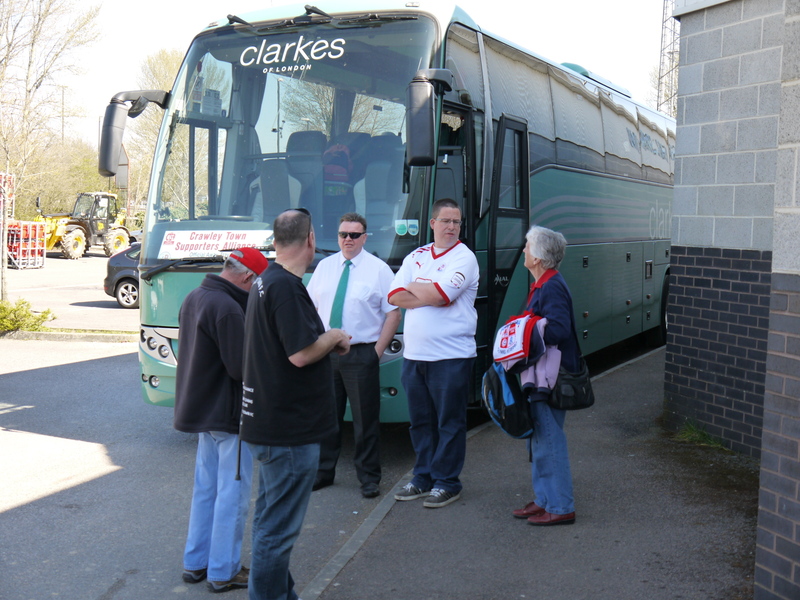 CTFC generously funded the CTSA coach, so it was no surprise that it was full and that the occupants were in high spirits when it left the Broadfield Stadium at 1PM on Tuesday. We decided to watch the DVD of the 1966 World Cup Final on the way up, as many of us were far too young to have seen it the first time- some couldn’t quite understand why the pictures had no colour! Travel Ken tried hard not to give away the final score! Our two winners- don't panic girls, they're married! After a quick stop in Leicester the group settled down to Kens famous travel quiz which Nick Hilton went on to win after a tie breaker. Tie break loser Mick Fox was very disappointed after getting the capacity of Wembley stadium wrong, he explained, “I am blaming my mate Steve who said it was 80,000!” Ken’s quizzes are highly competitive and it must be great to win one! John “the Gas” Lucy won the £20 scratchcard game, joking, “I’m going to buy everyone a drink, how many straws do we have!” You don’t get to be a utilities tycoon by parting with money that easily! Fans dug deep for the Chestnut Tree House Children’s Hospice, and after the £205 whip round chairman Ian said, “thanks to everyone who donated, we are delighted with the total amount here today. This- along with many collected Easter Eggs- will be donated to the charity on Good Friday.” Remember, you can still donate your Easter Eggs for the hospice- either direct at the club, to any CTSA Board member on Saturday, or bring them along to our match v Crewe on Good Friday. The Bradford Arms- no, they haven't been thrown out! There was a little traffic going into the City but the drivers made good progress and arrived in plenty of time for a quick ale and pie. Some ventured into the Bradford Arms- a pub possibly famous for its title of “smelliest gents toilets in the known world.” This was partly made up for by the fact that the beer was £2.20 a pint, but anyone there may have noticed that most people drank it in the garden! The ground looks empty, 15 minutes before kick off. 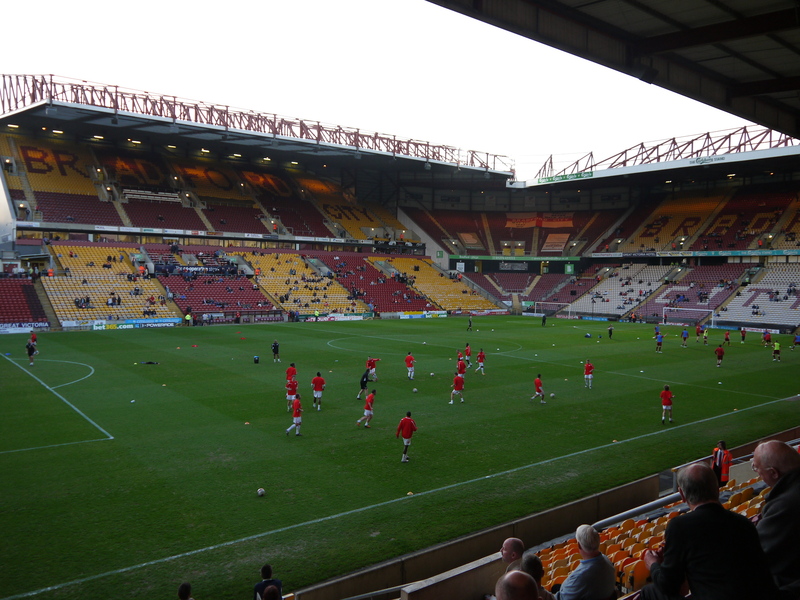 At this level, in fact at any level, Valley Parade (or whatever silly name it goes by these days) is truly a stunning stadium with a 25,000 capacity. The main stand and home end rise to a staggering height and it all curves around to form a sensational vista. The stand we were in and the other end are also very well appointed. Even with a “meagre” crowd of 9,000 the atmosphere was noisy throughout. A tough opening period sauntered by, whilst it lacked any real direction both teams were giving 110%. No surprise really with them battling at the wrong end and us looking for promotion. 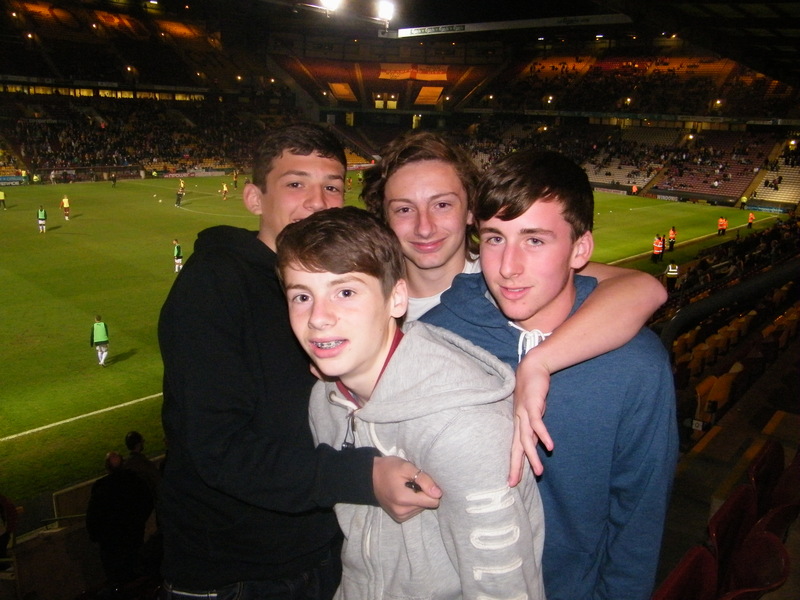 At half time Tom McDonald (Northgate) who was with 3 mates said, “it’s been a great day so far, we have all had some fun. I don’t think Crawley have really got into this game just yet but I think we can go on to win.” How’s than for an accurate prediction? The 2nd half burst into life when Leon Clarke opened the scoring sending the 90 or so Town supporters into noisy celebration. 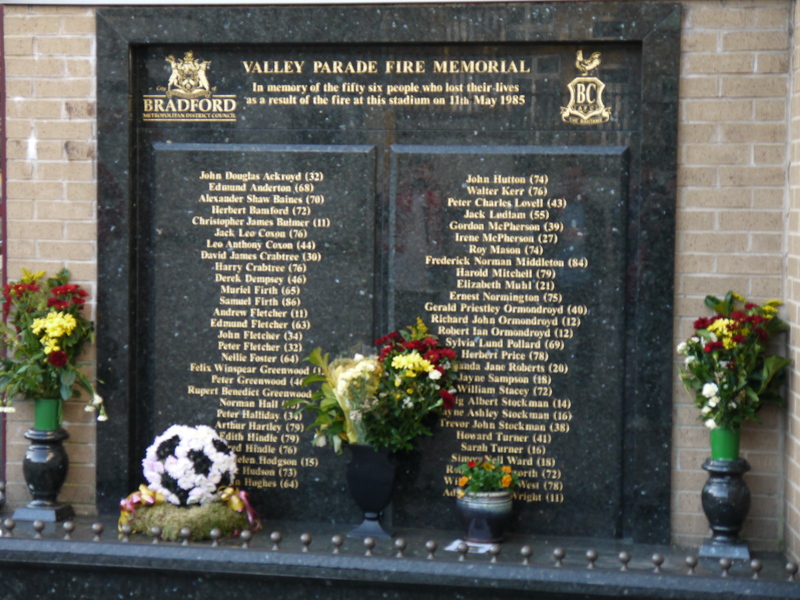 The whole atmosphere around the ground cranked up a notch and Bradford responded. After a couple of near misses they scored a decent headed equaliser. 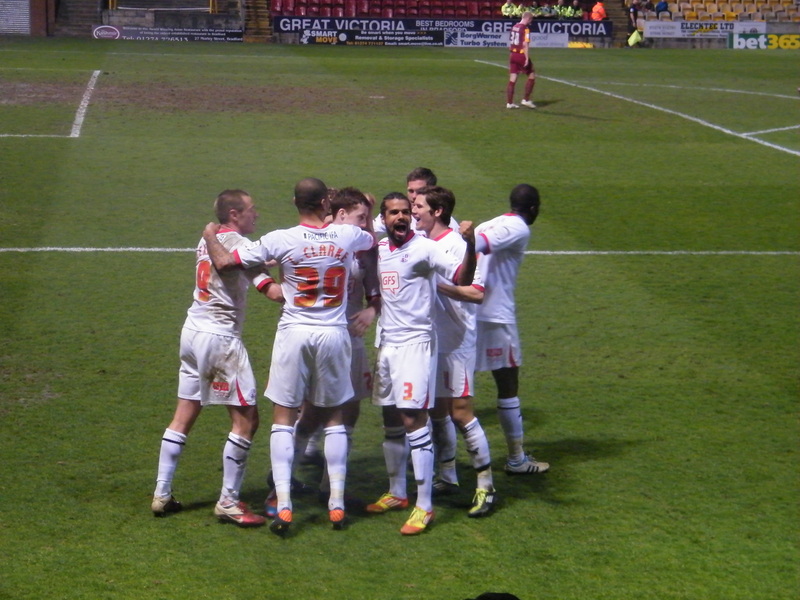 It proved a false dawn as Crawley immediately struck the winner. New Broadfield goal hero Alexander got up at the back stick and cooly nodded his 5th goal in 5 games. Sensing a home defeat both the team and fans really turned up the heat but couldn’t find a way through our solid defence. The game ended with noise and drama. 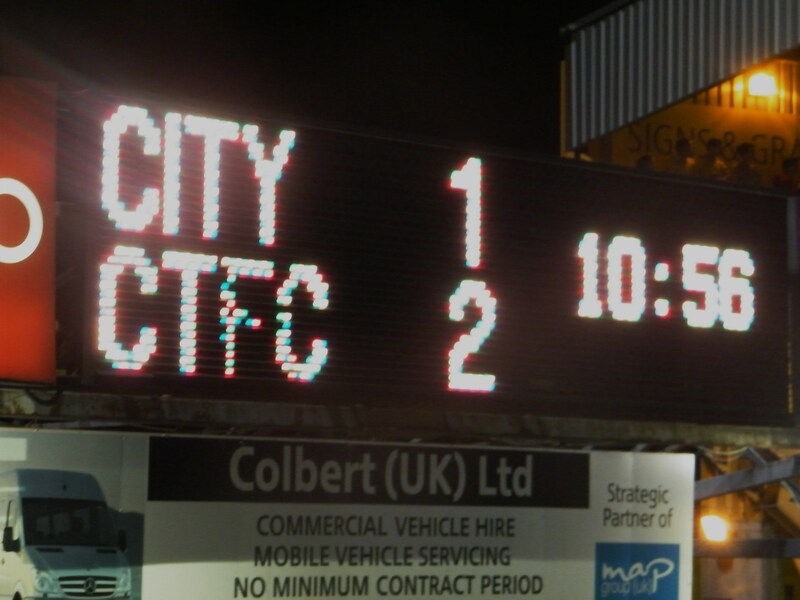 This was a big game for both sides, and we were delighted to get the three points, but City were rather less happy, as were some of their supporters judging by the rude comments made to some of us as we made our way back to the coach. Once on the coach a real party atmosphere prevailed, and we rocked and sang our way out of Bradford before most of us fell asleep around midnight and Travel Ken turned back into a pumpkin! 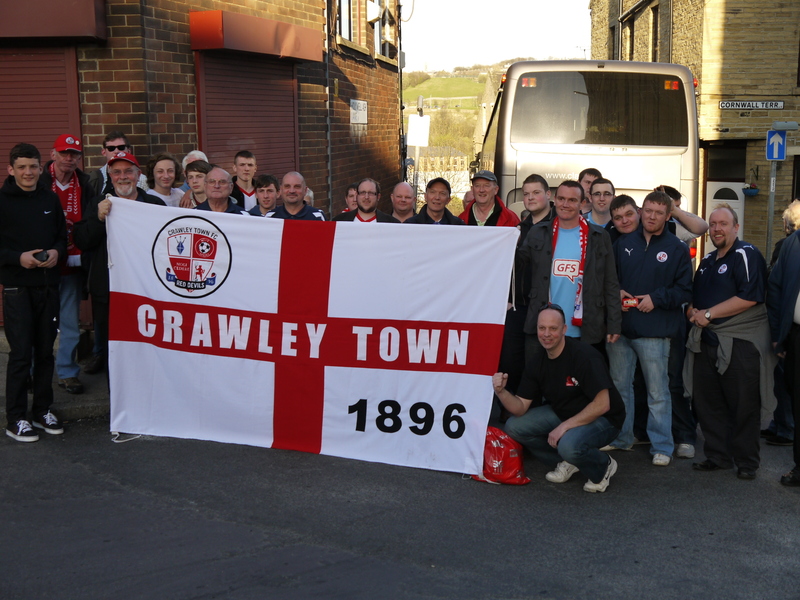 We eventually got back to CTFC at around 2.30 AM. Tyler Jones “great 3 points, thanks CTSA for a great trip”. 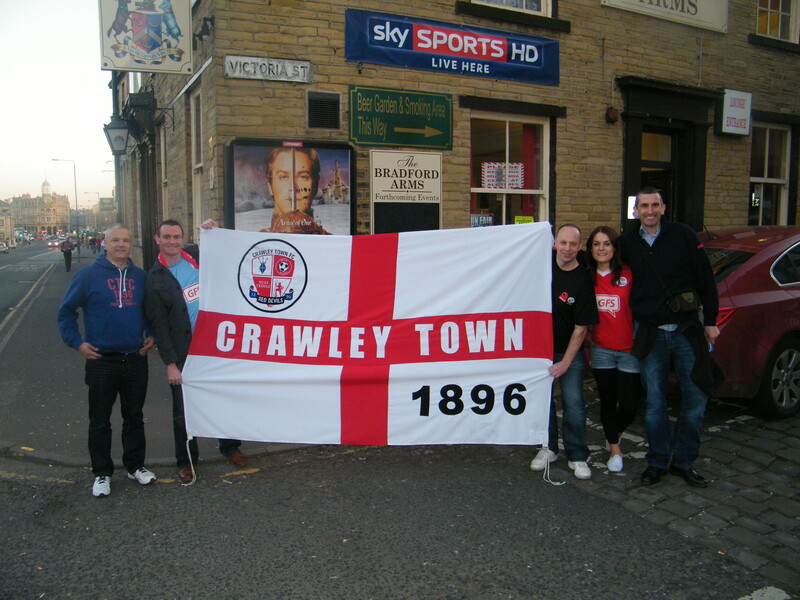 Rob Lowndes “The only way is Crawley! Pride, Passion and Guts. 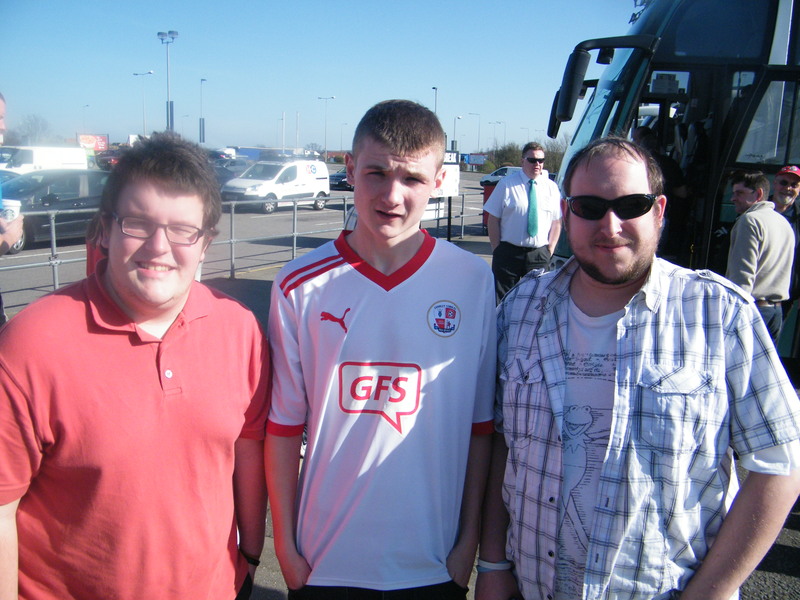 More pics can be found on our Facebook Page- linked from the homepage, take a look! 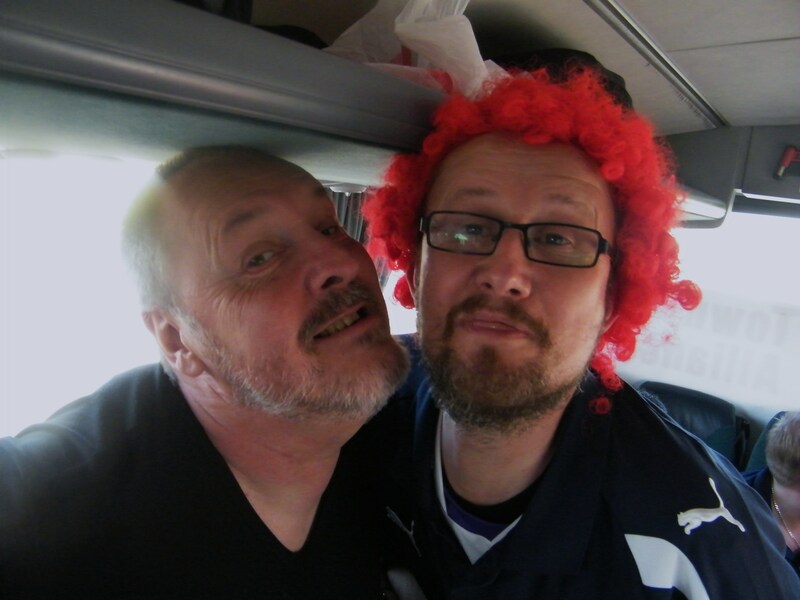 See you all at Burton on Saturday, and we’ve still a handful of coach seats if you’d like to book! Words and pictures from Colin “Wallace” Bowman with additional work by Ian “Gromit” Townsend. Deleted swear words from Paul” I’m not a fecking postman” Prendergast. Dancing from Travel Ken “Nureyev” Blackmore. Constant exclaiming of “they’re not with me” from James “embarrassed” Laraman. This time you can panic girls, they're not married!